Don’t use Google trademarks in a way that suggests a common, descriptive, or generic meaning. If the primary meaning of the word “Google” for the public becomes simply “to search the Internet” and not “to use the Google search engine to search the Internet,” Google will lose its property rights in the mark. Google [goo-guh l] noun, Trademark. 1. brand name of a leading Internet search engine, founded in 1998. verb (used with object), Googled, Googling. 2. (often lowercase) to search the Internet for information about (a person, topic, etc. ): “We googled the new applicant to check her background.” verb (used without object), Googled, Googling. 3. (often lowercase) to use a search engine such as Google to find information, a website address, etc., on the Internet. Meaning #2 in the Dictionary.com definition should be a source of concern for Google’s trademark lawyers, because it reflects a trend toward widespread indiscriminate mark-as-verb usage. Meaning #3 also raises a red flag, insofar as it suggests that one might “google” something using a search engine other than Google’s. (If you, as I do, experience dissonance or confusion at the prospect of googling with Bing or Yahoo, then you and I and the Arizona court are all on the same page.) For as long as search-engine users mean “use Google to search” when they use “google” as a verb, the “Google” mark will retain its status as Google’s intellectual property. Google wants its name to be synonymous with search, but not in a way that undermines its trademark rights. The outcome seems right, but I’m curious about Google’s usage rules, this one in particular: “Use the trademark only as an adjective, never as a noun or verb, and never in the plural or possessive form.” Is the first requirement Google’s way of saying the brand may only be used as a noun adjunct functioning as an adjective? That one must always specify Google [something: Analytics, Maps, etc.]? When using the Google trademark one must never say, e.g., “Google provides the following services […]”, because here it functions as a noun? Or here as a possessive: “The following services are Google’s […]”? Or, complying with the rule requiring a generic term following the mark, “Google’s search engine” or here, compounding two marks with a generic term, “Google’s AdSense™ advertising service”? In any event, we are well past the point where “google” causes dissonance for the ordinary user of language and web search tools. The need for legal protection is a reflection of the company’s concerns about this trend, not about misuse of the language. I’m not sure if you were saying something different above (or if you were characterizing Google’s view rather than the court’s), but I thought it worth a clarification. Laura, I didn’t mean to say anything different, but to the extent that it sounded as if I did, thanks for the clarification. Much appreciated. I think the question of whether “Google” as a noun comes to mean search engines generally and whether “google” as a verb comes to mean simply “to search the Internet” and not “to search the Internet using Google’s search engine” are closely related questions. The key, of course, is whether “Google”/”google” loses its ability to identify a unique source of services in the minds of consumers. The court is clear that even indiscriminate mark-as-verb use is not necessarily damning, but I think the court does flag it as a potential problem–a step down the road of uncoupling the mark from its source. 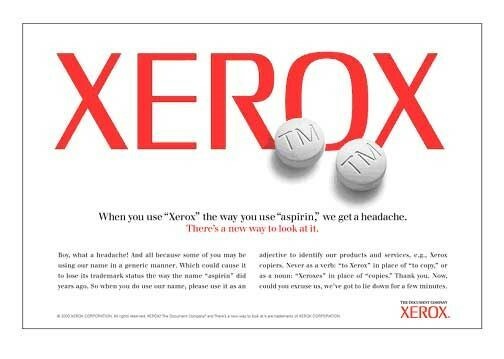 Bayer officially lost the “aspirin” trademark as part of WW2 reparations (at least in the US, UK, France and Russia), so it is cheating to cite it as an unqualified example of “genericide” (even though subsequent to its generic use in those four countries, it was genericided in many other countries). I go to see day-to-day some websites and sites to read posts, but this blog presents quality based posts.